This wasn’t the way Hixson’s Christian Crowe envisioned his senior year unfolding, especially on the heels of a career-best performance last week. But Crowe has learned how to process disappointment and heartbreak, something he and his family have cultivated over the past seven years. Along their difficult journey, though, they have also come to understand how gratitude and thankfulness can overcome even the bleakest of times. Crowe’s 12-year old brother, Brenden, was diagnosed with Duchenne muscular dystrophy prior to entering kindergarten. The condition, which primarily affects boys, is characterized by progressive muscle degeneration that historically saw few survivors beyond the teen years. However, recent medical advances have seen cases where men are living into their 40s with the disease. So when Christian battled the temptation to feel sorry for himself following a season-ending leg injury suffered last Friday against Red Bank, he only had to glance over at his brother to regain his perspective. Although five years younger, Brenden has taught his big brother lessons that have changed the entire framework of Christian’s life. Christian has witnessed the deterioration of his sibling’s body, robbing him of any normalcy of a childhood. 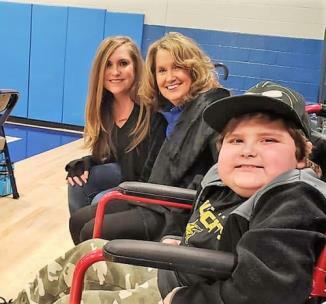 But he has also enjoyed a front-row seat to see how the illness, despite its progressive nature, cannot afflict Brenden’s indomitable spirit. Brenden’s struggle has also empowered Christian to recognize that, indeed, he is his brother’s keeper. And their bond forged through adversity has created an inseparable relationship that is celebrated whenever Christian competes on the hardwood. “Even though there’s some downside to it, I’m very thankful for our situation,” Christian said. “Because I always told myself that if I didn’t go through this, then I wouldn’t be the person I am today. I feel like God has brought me to Him through Brenden. Christian had averaged better than 18 points per game for the Wildcats as a senior guard and captain. He tallied a personal best 36 points against Ooltewah last week, giving him equal bragging rights in the family with his grandfather, Barry Lassiter. But Christian wasn’t alone when achieving success on the basketball court. 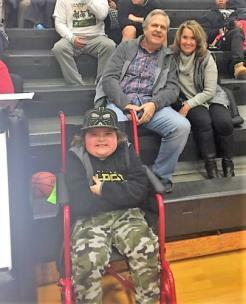 Whenever the Wildcats were playing, Brenden was front and center in his motorized chair seated next to the Hixson bench. While Christian has played his final game as a Wildcat, Brenden relished watching his older brother compete. “My favorite part is when my brother scores. It’s awesome to go to the games, and my favorite part is winning. Plus, we have a special fist bump we do,” Brenden said. 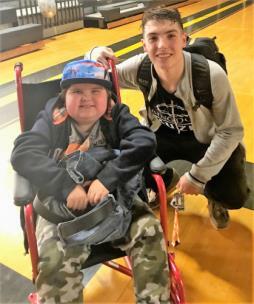 Brenden’s presence serves as a constant reminder to Christian of never taking things for granted. “He teaches me to be thankful for what I can do,” Christian said. When I see him there’s never a reason to be upset with myself. The only thing I should ever do is work hard and be positive. Every day he gets up and works hard just to do what he can do, so I look to him to give me courage when things might not be going well for me. Regardless of whether we play well or not, he’s always there supporting us and smiling. 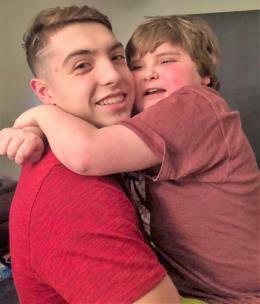 Their special bond is also manifested in Christian’s tireless tending to his brother’s daily needs, whether it’s helping Brenden to the bathroom, bathing him or picking him up to put him to bed. 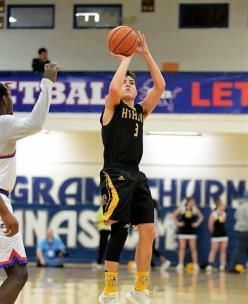 Their relationship will also impact Christian’s decision of where to attend college next fall even though he could likely earn a basketball scholarship. While the Crowes’ journey has been difficult the past few years, Heather is able to better comprehend the lessons learned along the way. “The pain we felt when we found out is a pain I can’t describe,” Heather said. “It’s upsetting when you find out you have a child that’s going to have a hard time. As the shock wore off, we just turned to God. That’s the only place we could go. We have a wonderful church that has surrounded us, and we recently had someone make a huge donation so we could buy a van for Brenden. God has been a part of all of that. Crutcher recognizes the lessons learned by having Brenden involved in the lives of his squad. “Even in a season like we’re having when you don’t have the success you want, we look at Brenden and have an appreciation to be able to play the game,” Crutcher said. “Rather than us worrying about wins and losses, we’re thankful each and every day. The family has established a GoFundMe account for those interested in helping the family cover some of Brenden’s medical expenses. Go to www.gofundme.com/brendens-chance for more information.